It’s holiday season, and whether you are traveling or staying put, we bet that buying gift buying is on your mind. Not to worry! We’ve pounded the streets of Phnom Penh to find unique gifts from locally-owned businesses which support local and female producers for a gifting season that can make you feel all warm and fuzzy inside for reals. 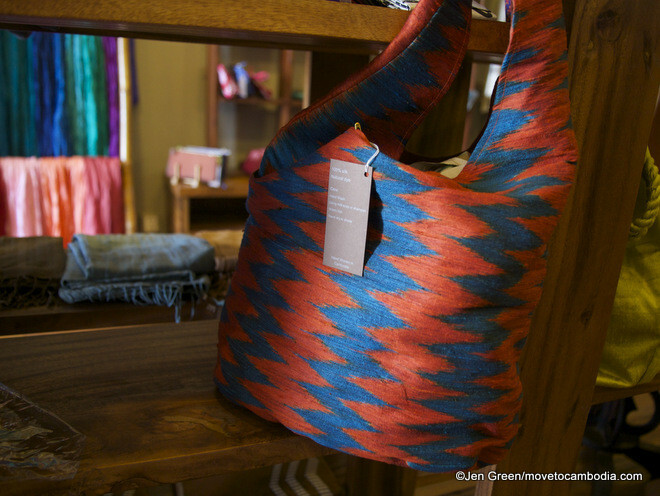 Buy your gifts responsibly, and delight in this bold ikat bag from Loom’s. This gift guide is heavy on textiles (scarves, blankets, clothing) because these industries can be run easily on a small scale by producers without massive capital investment. These gifts are surprisingly affordable — purses, necklaces, wallets and scarves start at $18 at almost all of these shops, so get your shopping list out and follow along. 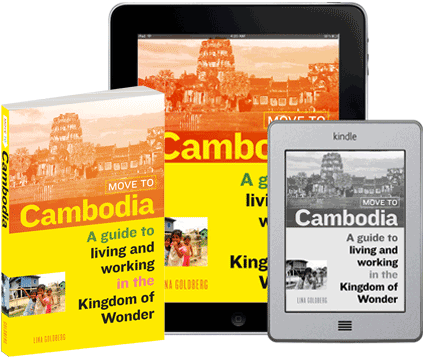 We have focused for this guide on locally-owned businesses, since socially responsible NGO and expat-owned businesses like Friends International, Tonlé, Trunkh., and CocoKhmer are pretty well-known already, and these Cambodian business owners are making excellent products or marketing for groups of other Cambodian producers. 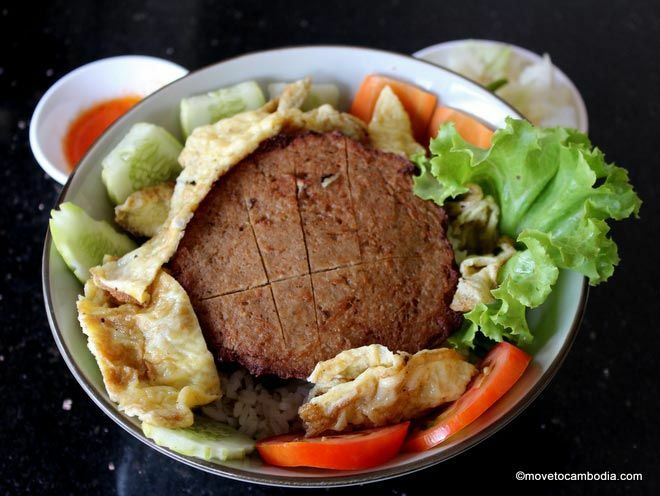 If you know of other locally-owned businesses selling products made in Cambodia, please share in the comments! 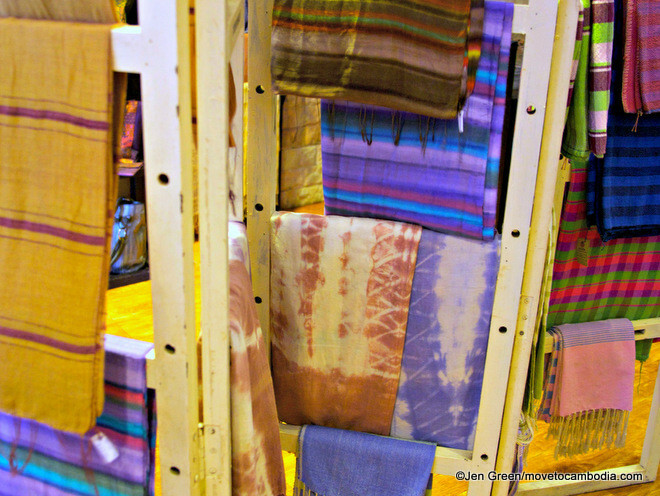 Tie-dyed scarves at Colors of Life. This shop doesn’t look like much from the street, where it competes with the likes of fancier shops like Insolite and Garden of Delight towards the Riverside end of 178’s “Art Street.” But alongside the same-samey silk scarves and bags are some beautiful striped and tie-dyed scarves in superfine silk and silk/cotton blends. Hand-painted silk scarves at Craft Village for all your scarf-wearing relatives. Craft Village brings together producers from four Cambodian provinces, and the products on display here showcase each of their unique weaving styles and specialties. From Takeo where very fine strands of silk are the specialty and the scarves are drip-dyed simply, to the vertical embroidery of Banteay Meanchey, the scarves here are affordable and great quality. Stripes were my favorite here — hand-painted on lovely silk scarves, or woven in washed out colors for cotton breton striped dresses. And check out the ikat wallets; an unusual and beautiful gift that anyone can use. By females, for females at Happy Silk in Phnom Penh. Featuring “Women for Women” products made by female cooperatives, this shop just off Riverside on St 178 is a gem. My favorites here were silk string necklaces accented with brass, and unadorned versions using tie-dyed silk — in great color combinations like grey and magenta, and bright green and royal blue. Mr Loom has been in the textile business for almost 20 years, and really knows his stuff. 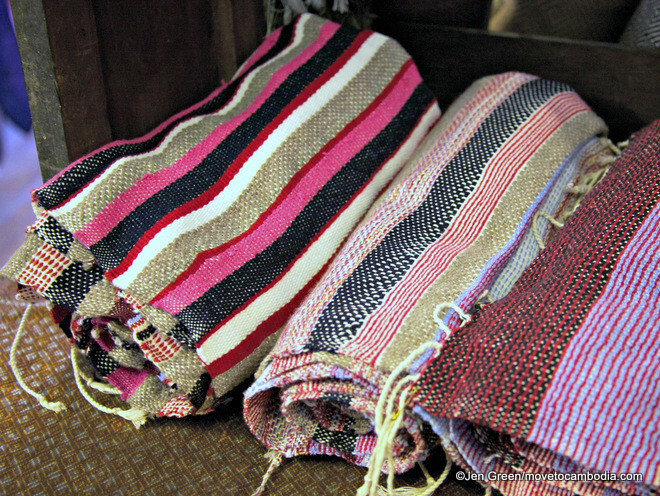 Cotton and silk, some dyed using only natural dyes, are woven into blankets with bright stripes reminiscent of Hudson Bay wool blankets for a warmer climate. The bright blue and orange ikat bag would also be a great, versatile gift for a textile-savvy traveler. 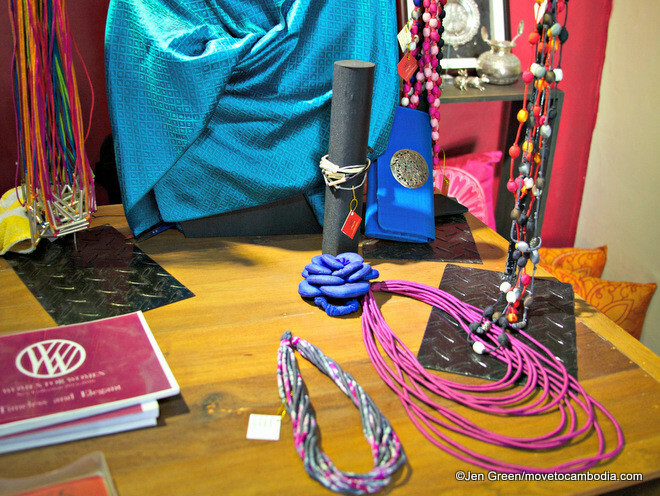 Mr. Loom also stocks products from other local coops and producers, including Afesip Fair Fashion. Make a silk purse out of a sow’s ear at Lotus Silks. Street 240 is known for its cute eateries and boutiquey shops, but Lotus Silks is one that can easily go unnoticed, but for the wooden boat on their sidewalk. This shop is surprisingly stylish, although some of the pattern combinations border on kitschy. They have a great selection of dresses from vintage fabrics, but if you are buying for someone else, stick with a cute clutch, wallet or purse. Open daily, 9 a.m. to 8 p.m.
Open daily, 9 a.m. to 5 p.m.
Open daily, 8 a.m. to 7 p.m. This entry was posted in Phnom Penh, Holidays and tagged Colors of Life, Lotus Silks, Loom's, Craft Village, Happy Silk. Bookmark the permalink. Goel Community, located near Russian Market is a Guaranteed Member of the World Fair Trade Organisation. Their products are handwoven using only natural dyes and fibres (cotton, linen, silk). Products range from clothing, bags, bedding to accessories. 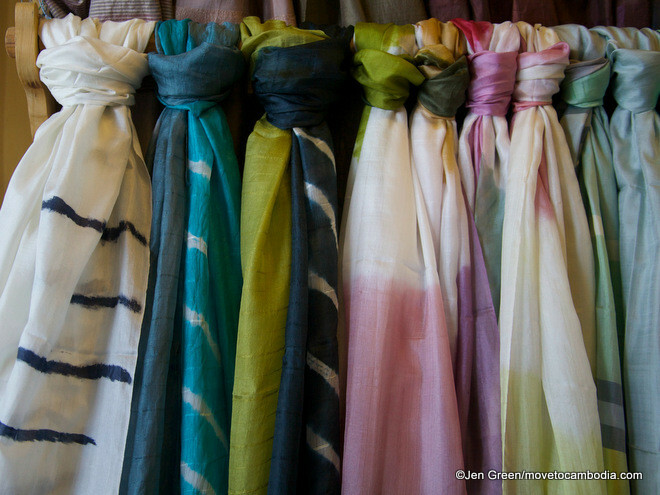 I would also suggest Ta Prohm Silk, a fair trade business run by landmine survivors. 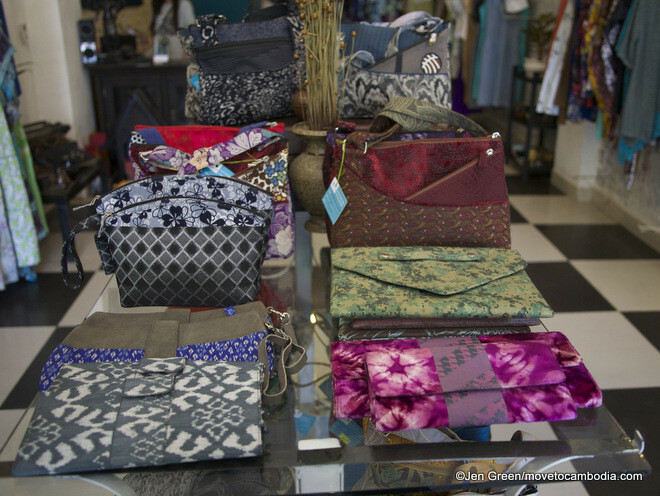 They have a wide range of silk products, plus items made from recycled rice bags, all reasonably priced. They have two shops, one on Arts Street (#495Eo, St. 178), the other near the Russian Market (#168A, St. 155).